What could make a beautiful city on an island covered with beaches, fresh fish, and oysters better? Meet Paula, our couchsurfing host. Paula has a heart much bigger than I could have ever imagined, she opened up her beautiful condo to Leah and me over the weekend. Couchsurfing has met a lot of opposition from friends and family. For those of you who don’t know what it is, www.couchsurfing.org is a online community of people who open up their homes for “strangers” to come and stay the night. The idea of couchsurfing is much bigger than a free place to stay, its an open canvas of cultural exchange. The niceties are always interesting in travel (where you’ve been, where you’re going, cultural and linguistic differences, etc). But the real beauty of our stay with Paula was much deeper. Minutes after meeting Paula, we felt at home, and talking with her was like talking to an old friend. Paula showed us Lagoa da Conceição a very trendy section of Florianopolis, with restaurants, shops, and street markets to rival any hipster area in an US city. We shared a large bowl of Acai and hours of window shopping. It was an acleptic mix of Brazilians, from the fashion-concious middle class, to the jewerly making Rastafarian, to the old men playing dominos. After a long stroll in Lagoa da Conceição we picked out fresh ingredients and cooked a pizza together; sharing stories, pictures, and wine late into the night. Paula’s friend Eleanor joined us for pizza and stayed for the rest of the weekend. 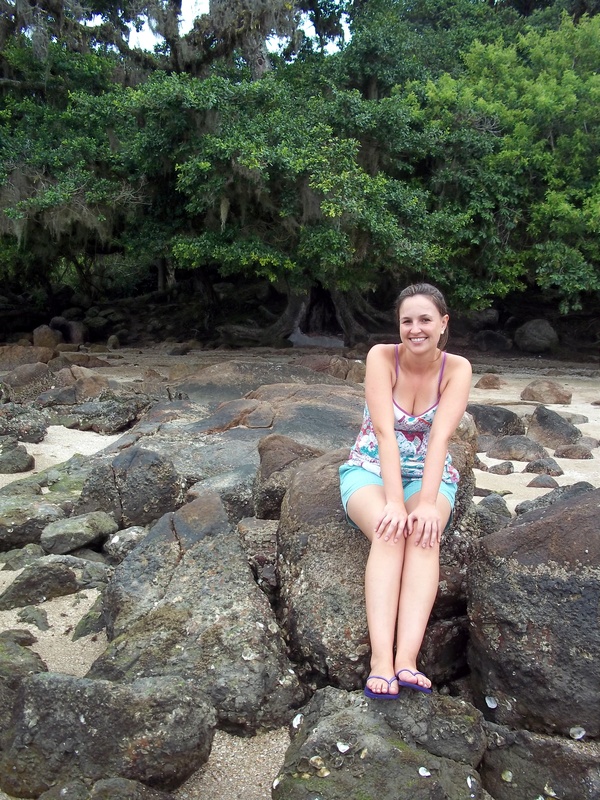 She is a lively, free-spirited british girl living in Paraguay. (well Paraguay this week, her country of residence seems to change faster than the weather). Eleanor was a godsend, with her experience as a tour guide in Boliva, and extensive South American travel, she helped us tremendously. 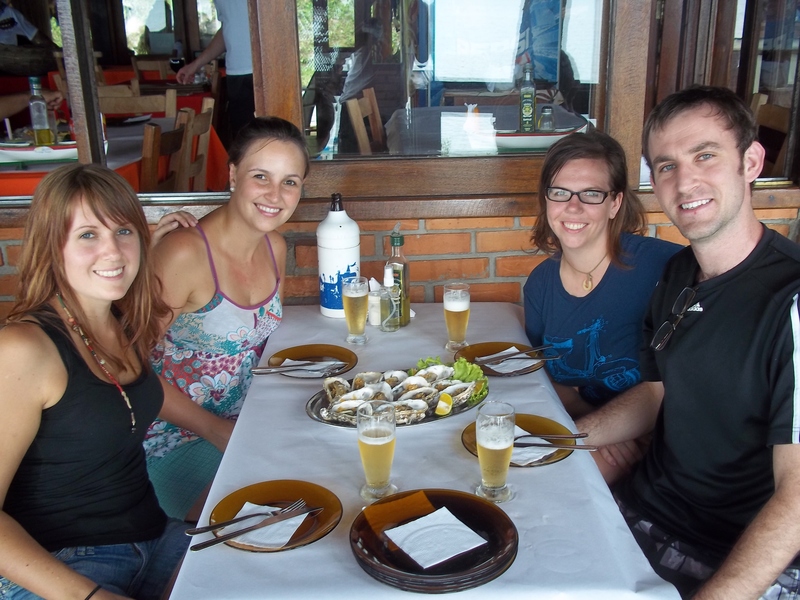 The next day Paula brought us to a delicious seafood restaurant in the San Antonio de Lisboa Beach section of the Florianopolis island. My mouth waters when I think about the meal of oysters, mashed yuca and shrimp that we all shared together. The views were splendid and the food to die for, all amist the best company this world has to offer. 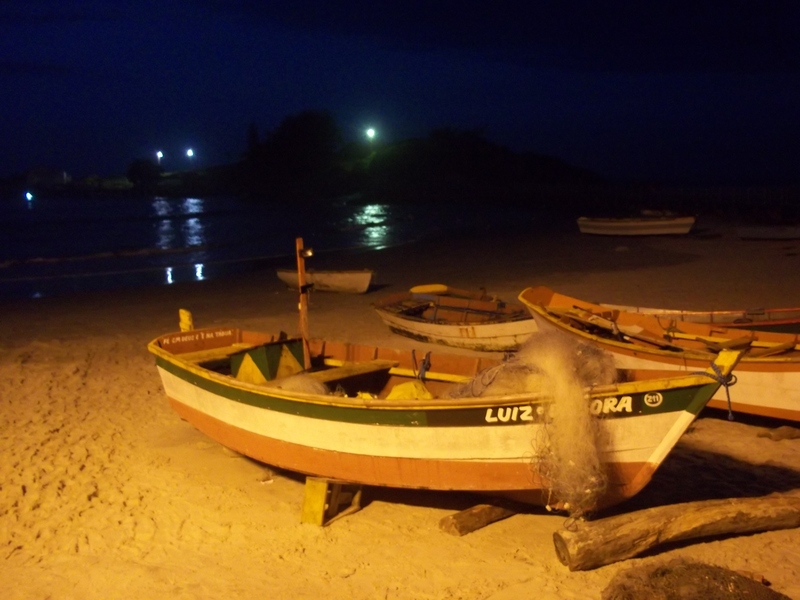 We shared a matte and watched the sunset on a bay sprinkled with fishing boats and osyter platforms. Florianopolis was a success and couchsurfing provided us with a door into the vast culure in Florianoplois, and further examplifies how caring and giving people are everywhere in the world. Its a true catalyst to live-long friendships. The mood is a bit somber as we leave this city we loved so much. Thanks again Paula and Elanor, best of luck in life and travels! PS Paula wanted me to spread the word that all Brazilians don’t live in trees, and they don’t ride elephants. Check out my photo album for more pictures of Florianoplois!